Tyrus Wong (traditional Chinese: 黃齊耀; simplified Chinese: 黄齐耀; pinyin: Huáng Qíyào; Cantonese Yale: Wong Chaiyiu; October 25, 1910 – December 29, 2016) was a Chinese-born American artist. He was a painter, muralist, ceramicist, lithographer, designer and kite maker. Wong has worked for Disney and Warner Brothers. 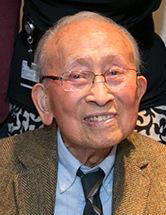 Wong's most famous work was for the Disney animated classic, Bambi. A Profile of Tyrus Wong by Rosalind Chang. Angel Island Immigration Station Foundation. Tyrus Wong. Disney Legend Disney Insider. This page was last changed on 13 September 2018, at 03:51.